Matej is Partner at Kirm Perpar. He specialises on Corporate & Commercial, Dispute Resolution, Intellectual Property and Real Estate. As an experienced litigator, with particular focus on complex commercial litigation and contract disputes, Matej advises on the entire spectrum of litigation, including interpretation and performance of contracts, unfair competition, warranty issues, contractual damages and tort, insurance law, etc. Matej co-heads the Corporate & Commercial team and puts particular focus on complex corporate and M&A transactions with real estate elements. 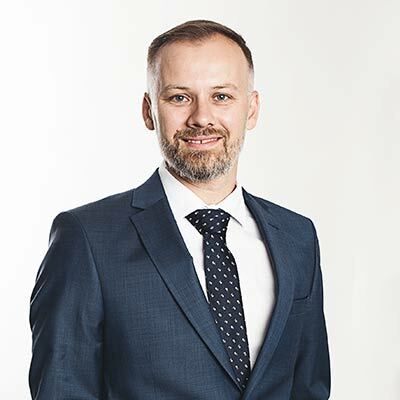 And as the head of the firm’s real estate practice, Matej advises property investors, developers, landowners, landlords and tenants, lenders and borrowers and suppliers on every aspect of real estate related transactions, including acquisitions, development, lease, construction and dispute resolution. In the field of IP, Matej’s practice focuses on protecting the core brands of his clients. He specialises in trademarks, the protection of company names and logos, anti-counterfeiting and representing clients in IP related disputes. Through his in-depth energy, infrastructure and mining industry know-how, Matej is a skilled leader of large-scale projects and advises clients on matters such as project development, financing, PPP/PFI, real estate and construction, regulatory, environmental and related technology, competition and dispute resolution matters. Matej is an expert in insurance law and has recently provided a study for the European Commission on law applicable to insurance contracts. His expertise includes industry specific regulatory and compliance matters, risk management, development of insurance products and licensing, market entry and sale strategies, representation in disputes and enforcement, for all insurance, life, non-life insurance, and reinsurance clients.